Interpreting the output: This query shows the synteny blocks in which the marker of interest is located. The top horizontzal bar is the synteny block on one chromosome and the bottom horizontal bar is the synteny block on the other chromosome. All markers are shows in unique color and their directionality is indicated by the pointed sides. 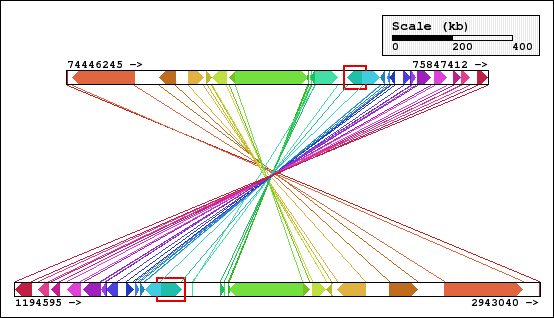 The homologous markers in the two chromosomes are connected by lines to indicate the correspondence. The marker of interest is indicated by a red rectangle. The start and the end of the synteny block is displayed at the far left and right of the synteny block. Syntenic blocks around the replication protein A1 (RPA1) gene in the mouse and human (panel A), as well as mouse and rat genomes (panel B), respectively. A set of orthologs common to all three genomes and default coarse-graining are used. 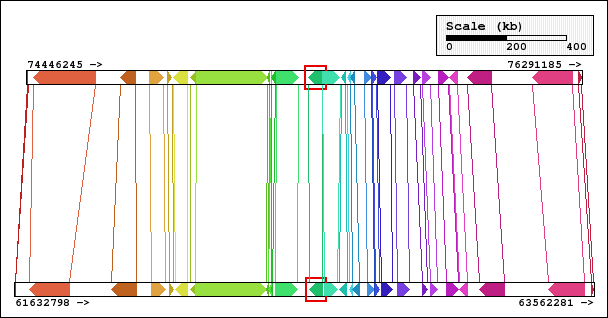 The RPA1 gene is highlighted by a red rectangle in each chromosome segment. Panel A: The synteny blocks in mouse chr 11 (top) and human chr 17 (bottom) which contain the RPA1 gene. Panel B: The synteny blocks in mouse chr 11 (top) and rat chr 10 (bottom) which contain the RPA1 gene.